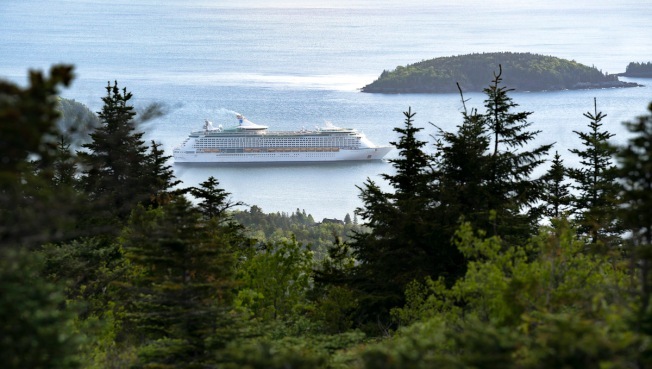 This June 4, 2018, file photo shows the cruise ship Adventure of the Seas off Bar Harbor on Mount Desert Island in Maine. A man in Portland, Maine, said he's applying for a $250,000 grant this week to study the feasibility of turning a used cruise ship into housing for those in need, NBC News reported. Kenneth A. Capron, who runs a Portland nonprofit that provides support to older people with dementia, said he wants to take a decommissioned cruise ship that can hold as many as 1,200 people and turn it into an economical weapon against a housing crisis that's being felt locally and across the nation. Capron said he plans to submit an application Wednesday to the Robert Wood Johnson Foundation for the grant. If successful, he would use the money to study the feasibility of docking a cruse ship along the shore of the New England port city to serve as housing. The analysis would look at purchase price, how much it would cost to refurbish or ready the ship and whether it should be home to mixed-income residents, homeless people or low-income workers.